When it was first revealed in November that WikiLeaks founder Julian Assange is under secret charges by the Trump administration, I spent the next few days being told by Russiagaters that this was proof that I have been wrong about their demented cold war cult all along, because #MuellerTime is fast approaching. At long last, they vehemently assured me, Assange was going to prison for working with Russia to deprive Queen Hillary of her rightful throne. None of those people have come back to apologize or admit that they were wrong when subsequent evidence disproved their claims. None of them ever do. As it turns out, whistleblower Chelsea Manning has been subpoenaed to testify before a grand jury in a secret case investigating Assange for his 2010 role in the WikiLeaks publication of military war logs and diplomatic cables. Manning served seven years in prison for leaking those documents to the transparency advocacy outlet before her sentence was commuted by President Obama, meaning, obviously, that this sealed case has nothing to do with the 2016 leaks Russiagaters have been fiendishly obsessing over. Indeed, the Washington Post reported yesterday that "U.S. officials, speaking on the condition of anonymity because of grand jury secrecy, say the case is based on [Assange's] pre-2016 conduct, not the election hacks that drew the attention of special counsel Robert S. Mueller III." So there you have it. Democrats like Center for American Progress president Neera Tanden who have been cheering for Assange's arrest have actually been cheering on the Trump administration's prosecution of a journalist for publishing facts about Bush administration war crimes. They thought they were supporting the agenda to punish Assange for publishing leaks that hurt the Hillary campaign, but in reality they were defending two Republican administrations while helping to manufacture support for a prosecution that would set a devastating precedent for press freedoms throughout the entire world. If you are unfamiliar with the work of Russiagate Grand Wizard Rachel Maddow, you might think she would report the revelation that an unfounded belief held by many of her acolytes has been completely and thoroughly disproven once and for all. If you are a bit more familiar with her, you might assume that she would completely ignore this revelation like she normally does when her conspiratorial ramblings are disproven by facts and evidence. But if you know Rachel really, really well, you might guess what she actually did on her show last night. That's right, she flat out lied about it. On last night's episode of MSNBC's most popular show, Maddow blatantly deceived her audience by weaving this story about the Chelsea Manning subpoena into her conspiratorial Russiagate ramblings about Roger Stone, despite those stories having absolutely nothing whatsoever to do with one another. Maddow began by gushing about investigations into Roger Stone's alleged connections to WikiLeaks, of course not mentioning the fact that the only known interactions between Stone and WikiLeaks consist of WikiLeaks telling Stone to stop lying about having connections to them. Maddow smoothly weaved this into the news that the House Judiciary Committee has formally requested documents pertaining to WikiLeaks (among many other things) from dozens of Trump associates, with a gigantic grin on her face and a tone of immense significance in her voice. 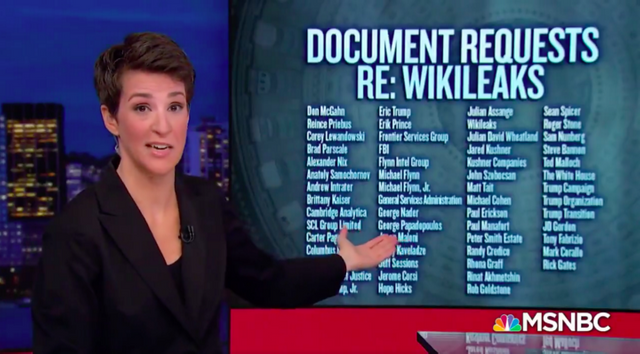 Then, without pausing, Maddow began talking about the sealed case against Assange and the Manning subpoena, falsely suggesting that these had something to do with the things she'd just been speaking about. "And because of the criminal case against Roger Stone, you should also know that today, in federal court in Virginia, little bit of drama," Maddow said. "Today in federal court in Virginia, the US attorney himself, the top of that prosecutor's office, the EDVA US attorney himself, personally turned up in court for a sealed hearing today that appears to be about some sort of legal case potentially involving WikiLeaks and/or Julian Assange." 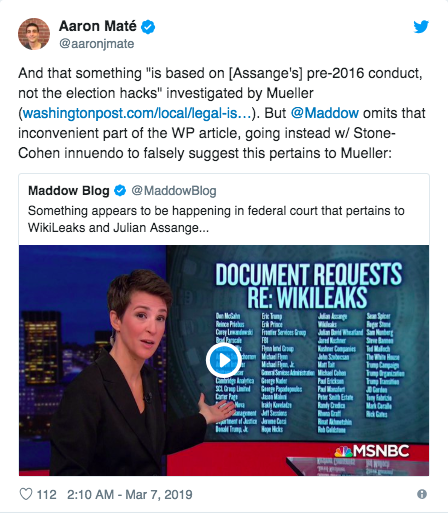 Maddow then went on to describe November's revelation via court filing error about Assange's sealed criminal complaint with her trademarked conspiratorial "you can't tell me this is a coincidence" histrionics. She then cited a Daily Beast report that former WikiLeaks volunteer David House had accepted an immunity deal in exchange for his testimony before this grand jury, completely omitting the fact that the report explicitly states that this testimony pertained to the 2010 leak drop and not anything to do with 2016. "Late Thursday, Manning revealed that she’s fighting a subpoena to testify before a grand jury that’s been investigating Julian Assange for nearly nine years," the Daily Beast article reads in its second paragraph. "But Manning isn’t the only one being dragged into the aging probe of WikiLeaks’ first big haul. A former WikiLeaks volunteer who was also personal friends with Manning was subpoenaed last May." Maddow knew this, and willfully distorted it to fit her narrative. "So, all of this to say between that court filing error in November, the reporting around that error that suggested that it was weird that he was in that case and it was a mistake but the information was true, and then what we saw today in Virginia, something appears to be happening in federal court that pertains to WikiLeaks and Julian Assange. And this is happening as the president's longtime advisor Roger Stone goes to trial for lying to Congress and witness tampering, allegedly, about his supposed communications with WikiLeaks during the campaign. It happens potentially as he's going to jail for violating the gag order in that case. It happens as tons of people associated with the president and his campaign are being asked detailed questions by the Judiciary Committee about their interactions with WikiLeaks, including during the campaign, and it happens within a week of Trump's longtime personal lawyer Michael Cohen testifying before Congress that the president, himself, was personally notified by phone in advance about WikiLeaks' plans to dump stolen material that Russia hacked from the Democrats during the campaign." So she just plain lied. By suggesting that the Virginia grand jury has anything at all to do with Roger Stone's walking clickbait shenanigans, the House Judiciary Committee's investigations into possible Trump malfeasance, and Cohen's testimony that Trump had advance knowledge of the (already publicly announced) upcoming WikiLeaks drops, Maddow knowingly deceived her tinfoil pussyhat-wearing audience into holding out hope that legal proceedings will soon be vindicating their cult. Maddow then kicked it up into ultra-mega-Super-Saiyan-galaxy-brain Russiavaping by telling her audience not to Google any of the things she was telling them, because they'll get computer viruses if they try. 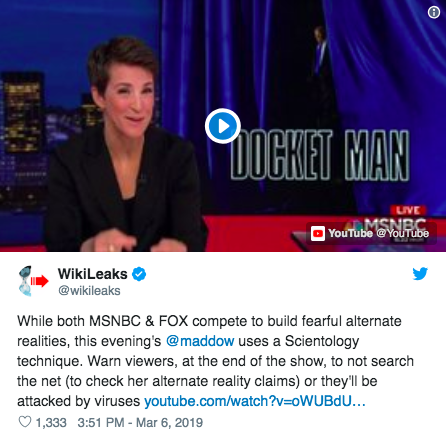 "Now I will warn you," Maddow said with a laugh, "if you are an interested news consumer who is interested in following this part of the story, I will warn you: just about everything that pertains to WikiLeaks, Julian Assange and Roger Stone is basically un-Googleable. All the online trash that relates to these characters, put your virus protection on. But something does appear to be happening there in federal court." Needless to say, this also is completely false. Google algorithms are slanted in favor of mainstream news media, not toward websites that will give you a "virus", so the top results you get when you type in WikiLeaks or Assange's name will always be news stories from conventional sites, many of which today refute Maddow's claim that the Manning subpoena and grand jury have anything to do with the 2016 Trump campaign. And of course, that's the point. Narrative management is Rachel Maddow's job, for which she is extremely well-compensated, and the more isolated she can keep her audience within a tight, narrow echo chamber, the better she can do that job. Rachel Maddow is nothing other than a cold war propagandist, rewarded like all her colleagues for promoting falsehoods to keep mainstream liberals supporting longstanding US government agendas against noncompliant nations while still letting them feel like rebels. In today's media landscape, powerful and opaque government agencies are scrutinized and criticized far, far less than a lone political prisoner in an embassy who revealed inconvenient facts about those agencies. The campaign to smear, silence and imprison Assange tells you all you need to know about the governments that WikiLeaks has exposed, and the mass media's complicity in that campaign tells you all you need to know about them as well. Rachel Madcow has entered the Alex Jones phase of her career. SAD!! I'm sorry but anyone who is watching mainstream media for real news deserves every lie they are fed.